Using public green as gardens. Enabling inhabitants to give the neighbourhood an own identity and enhance the social relationships between them. Overvecht is a disadvantaged neighbourhood in Utrecht. It is an area where condos are in abundance, so if you look outside your window you only see “grey”. Due to this fact the neighbourhood doesn’t have a positive identity. Another problem is that individualism stands central in this neighbourhood, the inhabitants do not know each other, they do not know who their neighbours are and that is a big problem in the Netherlands. This problem arose from the fact that the community is multicultural and people are not used to each other, so every positive social impulse is welcome. Especially in the condos there is little social control and people do not feel responsible for each other. This solution is not new. It is already internationally known, but in this case the solution is context specific. It gives the neighbourhood it’s own identity and solves the main problem of lack of social contact in the neighbourhood. From the Loan Gardens initiative, initially taken by an artist inhabitant of the neighbourhood, new services have been developed The Loan Garden service itself has improved and housing corporation Portaal created a new division that focuses on social circumstances. 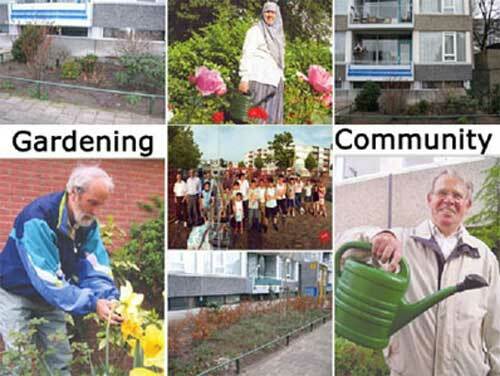 Together with inhabitants this division aims to improve the neighbourhood. Inhabitants mostly buy the plants and tools by their own · The office district or the housing corporation provide subsidy when necessary · The office district has a district budget which is also available for the loan gardens. Due to the fact the inhabitants started doing things together, the communicative boundary is disappeared. It is now less hard for a Dutch inhabitant to start a little chit chat with for example a Moroccan man. People will start feeling more accepted in the society and that will improve their functioning in the daily live. The fear for the unknown disappears, for example inhabitants now know that one of the “hang around” youngsters is the son of Mister Chamli. The environment gets an own identity, because every loan gardener or resident’s committee adds his/her own garden design. It also results in an environment that is cleaner. Not only the gardeners maintain this neatness also the non active inhabitants, because they see the result of their neighbours and local residents so it becomes less attractive to use the street as a litterbin, so everyone is alert! The only economic benefit is for the municipality which saves on public space maintenance.